When we built our house, we had two boys. And we built two bedrooms upstairs with a playroom in the third bedroom space. My thought was that we would eventually convert the playroom to accommodate the third boy that soon arrived. Instead of spreading out, my boys have all moved into one room. At first I thought it was just a fad, so we had a bunk bed that I put the mattress from the other room underneath as a makeshift trundle. As the years passed, we realized that this wasn’t a fad and coming up with a more permanent solution would be worth my time. When my husband and I upgraded our king bed downstairs, I measured it and found that the old king mattress WOULD perfectly fit under the top bunk. 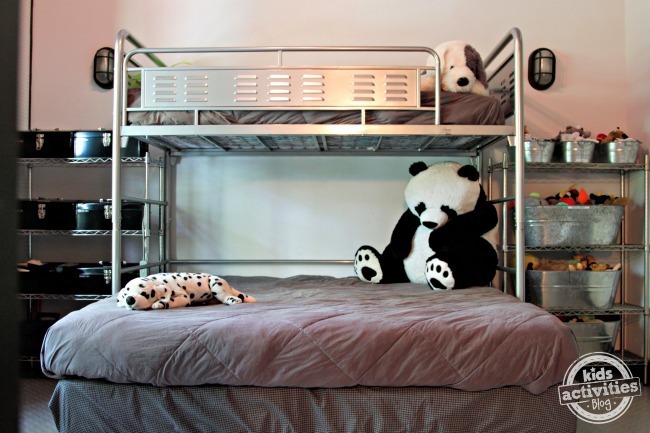 Now three boys have space to sleep without pulling a mattress out from under a bed. 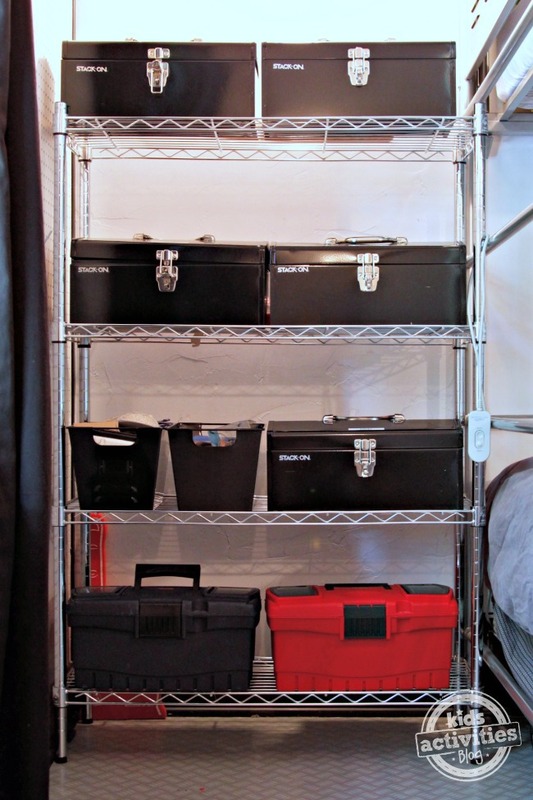 Keeping three boys organized in one room has been easier with the use of garage/tool organization furniture. 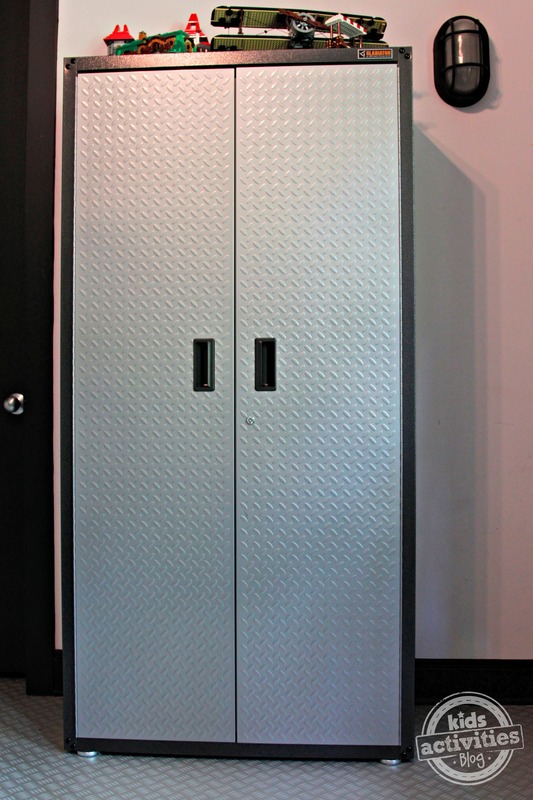 Having an industrial look to the room has been a huge perk – the garage storage units are STURDY! They are also much cheaper than REAL furniture! Perfect for boys. 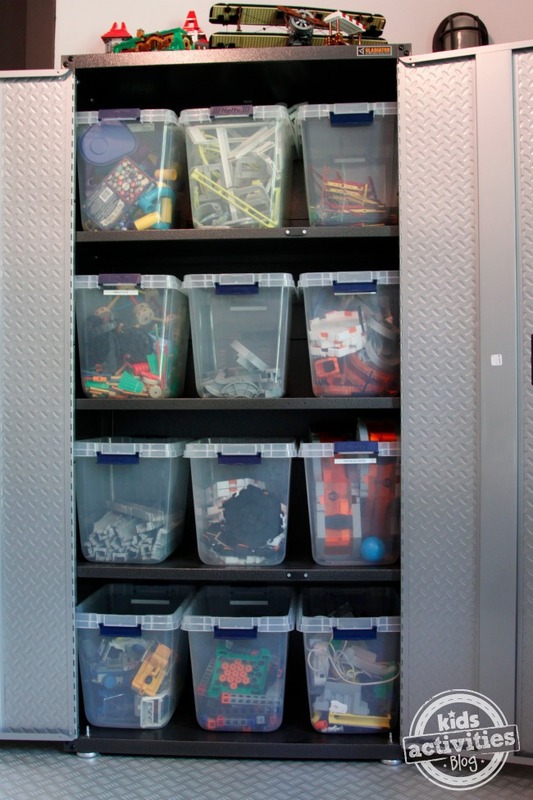 The inside of this galvanized garage storage units is a series of large plastic bins – each is large enough to hold those sets of toys that boys accumulate – Hex Bugs, Marble Run, Tinker Toys, Lincoln Logs, and LEGO robotics. Having each set in a movable bin has helped keep one set out at a time and an easy way to put away a wayward piece. 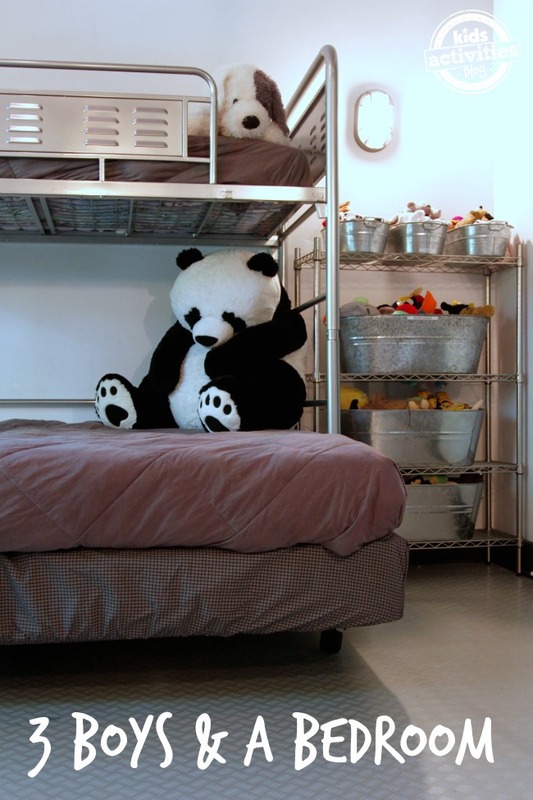 On either side of the bed is a shelving unit with metal shelves. 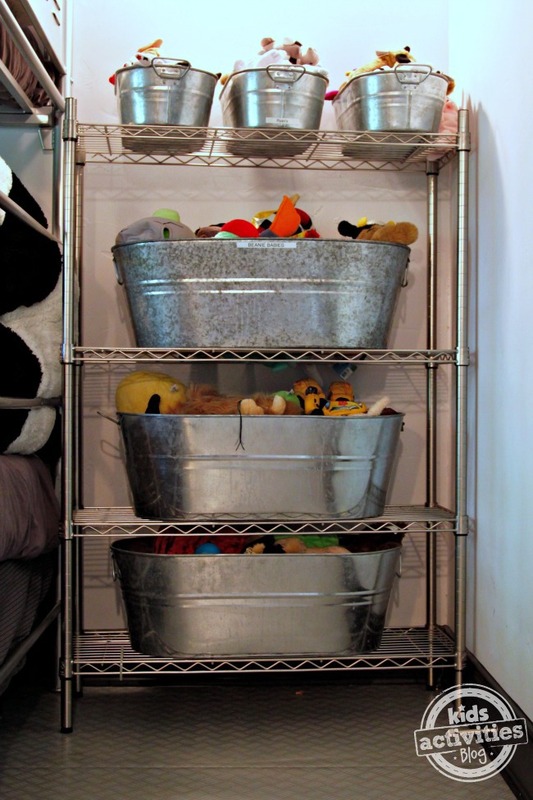 One set of shelves have galvanized metal bucket/bins that hold the extensive stuffed animal collection. The other side has tool chests which are labeled with the boys names. This is the kids treasure collection that I wrote about awhile back. This system has worked amazingly well! The boys’ closet is separated into three areas. I use bins for socks, underwear, shorts, pants, and shoes instead of drawers. Those line the floor of the closet and I had a low shelf built in there for another layer of bins. Each boy has an area for hanging clothes – but I try to keep that to a minimum since boys don’t tend to HANG clothes. They tend to UN-HANG clothes! The other bedroom is vacant. The third is still the playroom. Someday they may spread out, but for now it is 3 boys sharing one bedroom!